This 1960s Marimekko Print is probably my favorite textile print of ALL TIME so you can imagine how excited I was when I found a cotton-quilting fabric in this print. 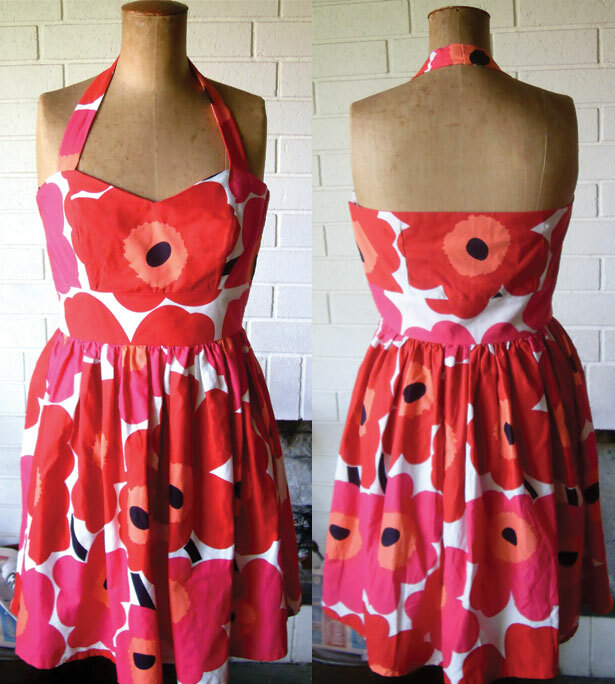 This dress is made with a sun dress pattern I drafted myself (my most used pattern). I should probably mention the zip is a side zip. Happiness is walking around in summer in this dress. I feel feminine, lively and just more “me”. As you can see I am not too fussy when it comes to matching up my print. But I did want the red flower to be in the middle. Fabric: About 2.60 meters of this glorious lightweight cotton with 1960s Marimekko design. The fabric was about $16.96 a meter. Lining: lined the bodice with a red lightweight cotton. Fitting notes: Excellent fit. My favorite pattern.